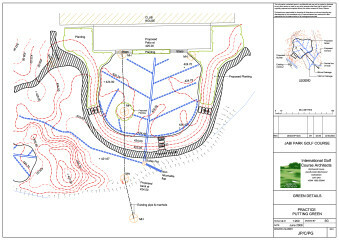 for greens /tees and fairway bunkers these are usually produced at a scale of 1 : 200 and illustrate all proposed contours at 0.25 mtr. intervals or on the greens at 0.125mtr. intervals, spot heights, drainage, areas of amelioration etc. from the detailed plans a bill of quantities is produced which is then submitted to a number of approved contractors. 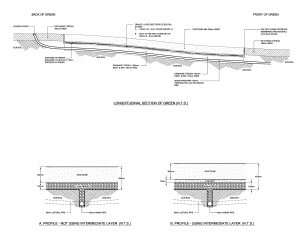 a carefully tailored specification is written to reflect the site and the project requirements. This is included in the contract documentation.